This inspiring new park in downtown Winnipeg invites visitors to interact with stories of the Fort’s past through sculpture, audio, video, web and mobile technologies. As a member of the park’s larger design team, Pattern led the design and technical execution of several of the park’s most innovative features. 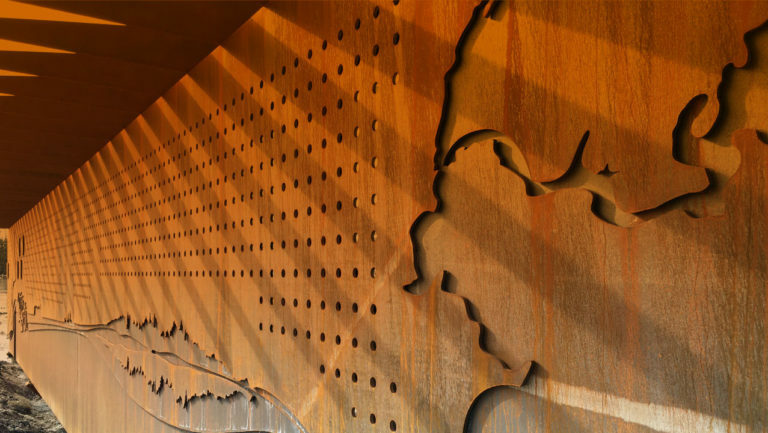 Each symbol on the 400-foot long Heritage Wall represents a significant story of Manitoba's past, present or future. The still lake becomes rushing water, representing the resource that has provided the province with energy. 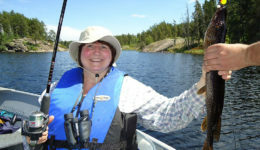 The forest, lakes and waterways are the source of Manitoba’s prosperous hydro, forestry and mining industries. 62.5mm pixels form the high definition screen found directly behind the stage. These provide clearer stage visuals compared to the 125 mm spaced pixels that populate the rest of the wall. 7,000 RGB LED’s across the 400 foot Heritage Wall provide sufficient brightness for visitors to experience the park, night or day. Mobile technology connecting park visitors to the past through 400 feet of seamless light, steel, video and audio. Visitors will experience different sights and sounds based on where they stand in the park. 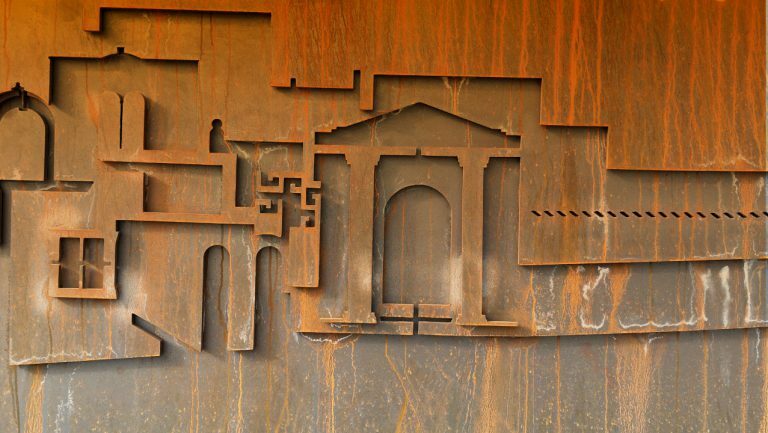 400 feet long and up to 13 feet high, the Heritage Wall consists of three layers of plasma-cut weathering steel that combine to create beautiful illustrations of symbols that tell the history of Upper Fort Garry. Pattern helped with the design in 2012, with the majority of the art finalized in late 2013. 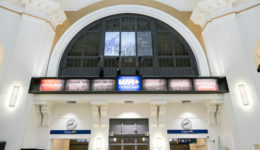 As the park’s Technical Lead, Pattern managed the planning, design and technical execution of the LED “pixels” being housed in the Heritage Wall. These lights form a coarse screen for unique animation and video that will further enhance the inspired stories being communicated. 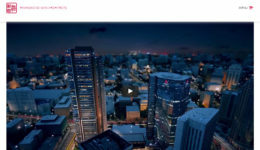 Pattern has created an immersive user experience allowing visitors to to bring the Park to life. 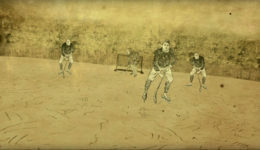 Using the Park’s mobile app visitors are able to trigger audio visual moments in Manitoba’s history to appear along the 400-foot long Heritage Wall. 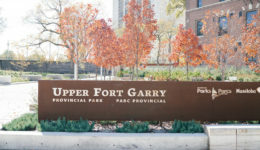 The free Upper Fort Garry app for iOS and Android provides a GPS-enabled guide that contextualizes the illustrated stories cut into the steel of the Heritage Wall. The app includes details about on-site Points of Interest and Stories about important events that occurred at the Fort over the years. Archival imagery and links to further reading complete the experience. Pattern also helped plan and execute the installation of free public Wi-Fi at the park, which will be launched in the near future. 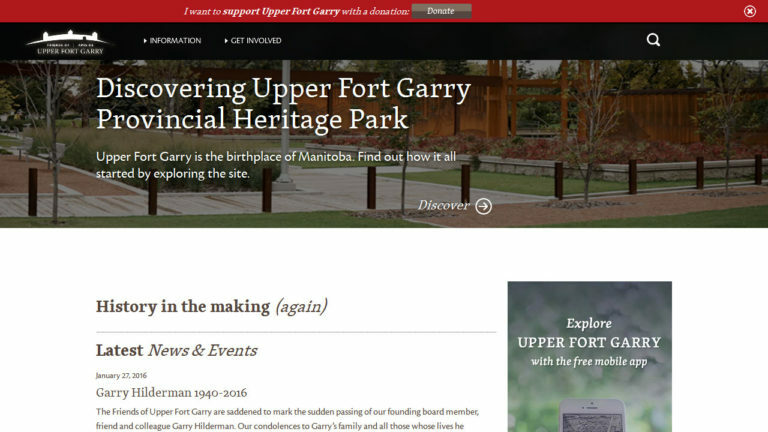 The Upper Fort Garry website was initially designed to be primarily an educational resource. 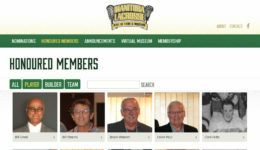 Pattern is working with the Friends of Upper Fort Garry to convert the website to a comprehensive, user friendly guide in helping visitors learn about Manitoba’s history. 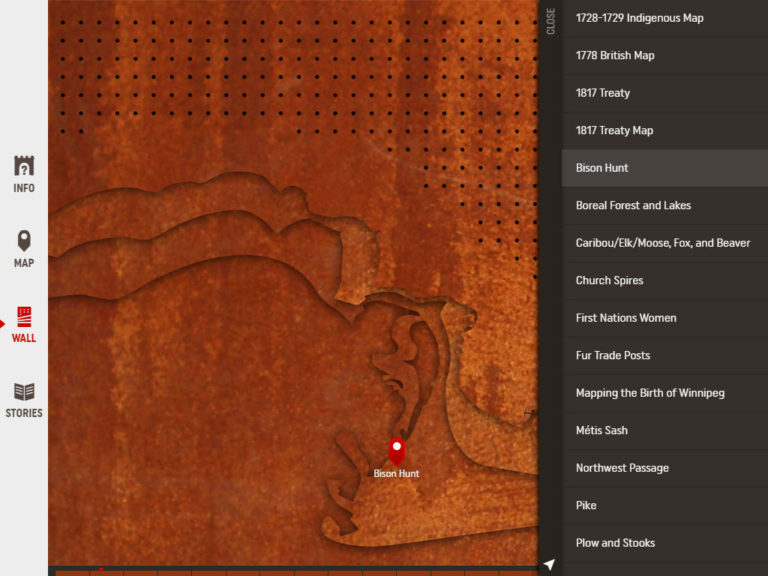 The website provides visitors with maps and background information on Upper Fort Garry. An extensive library and Resources section offers an excellent collection of audio/visual media resources for research into the history of Upper Fort Garry and Manitoba. Archival imagery and links to further reading complete the experience. Pattern also helped plan and execute the installation of free public Wi-Fi at the park, which will be launched in the near future. Pattern documented the detailed etched-steel construction and specialized installation of the Heritage Wall, providing a behind-the-scenes look at the making of the park’s key feature.